I love french fries. It’s kind of a problem. Like, if there are french fries, I will just keep eating them until there aren’t any more. Sometimes I don’t even realize I’m still eating them. My husband makes fun of me for it. I guess the good news is we basically never eat fast food, so we rarely eat french fries. I made my own Cajun seasoning rather than using one you can buy at the store on the spice aisle because those tend to be mostly salt. 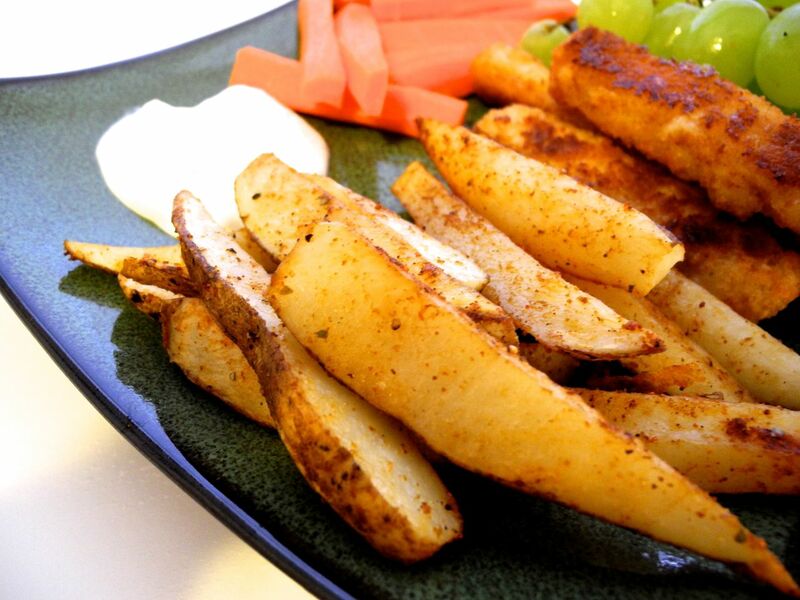 This one does have salt in it, but is also full of other spices to give the fries lots of flavor! This seasoning mix would also be really good for grilled chicken, corn on the cob, or other veggies. 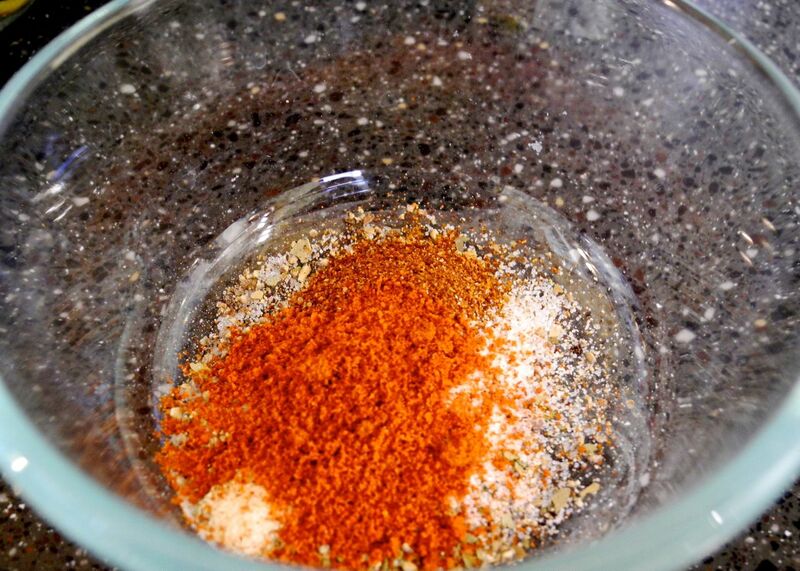 Mix all spices together, and use on french fries, chicken, vegetables, etc. or store in an airtight container until ready to use. This spice mix makes enough for about five medium potatoes if you’re making Cajun fries. You can easily double, triple, or quadruple the recipe if you’re making more fries, chicken, etc. or just to store for another day. Now on to making the french fries! Cut the end off the potato so it’s flat and can stand up. 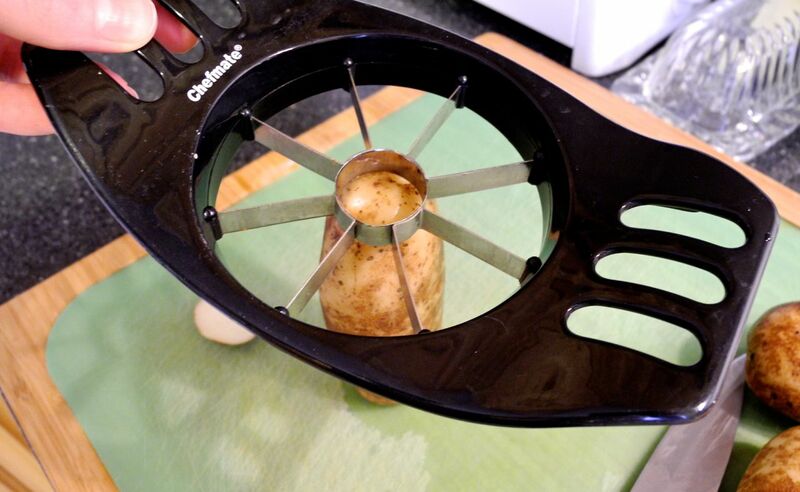 Then use an apple slicer/corer to chop the potato. You’ll want to cut the center “core” piece smaller – I usually cut in in fourths. Ta-da! 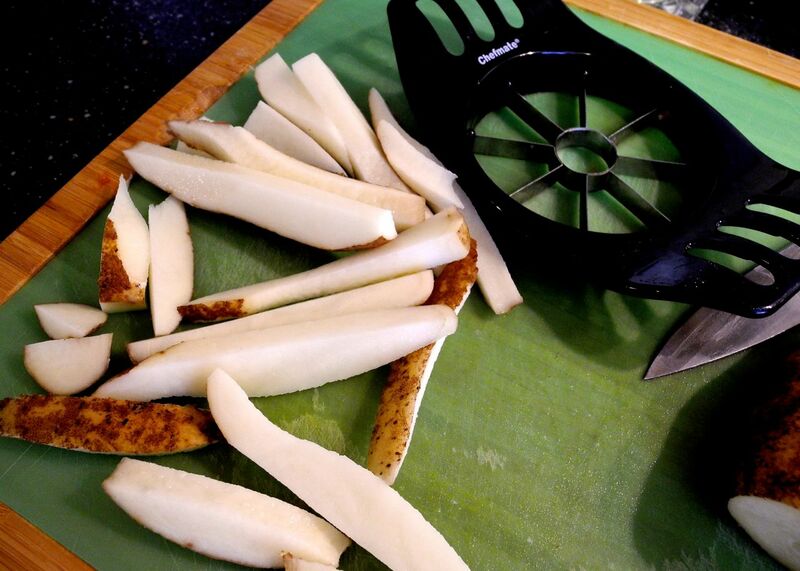 Lots of french fries cut in a matter of moments! Now just toss them in a bowl with some olive oil, then add the Cajun seasoning and mix to coat. You’ll probably want to turn them over/mix them around about half way through just so they don’t stick or get too crispy on just one side. The easiest way to do this – since the foil cools almost instantly, pull them out of the oven, lift the edges of the foil, and just shake them around. Then use a fork to spread them back out, and stick them back in the oven. 1. Preheat oven to 450. Wash and trim the potatoes, removing any bad parts. Cut into long thin strips (see tip above). 2. 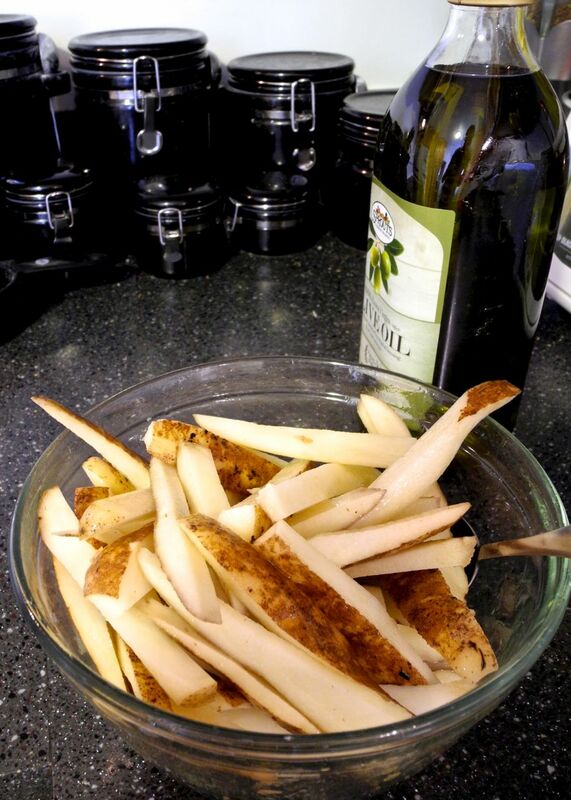 In a large bowl, toss potatoes with olive oil until evenly coated. Sprinkle in the Cajun seasoning and mix well. 3. 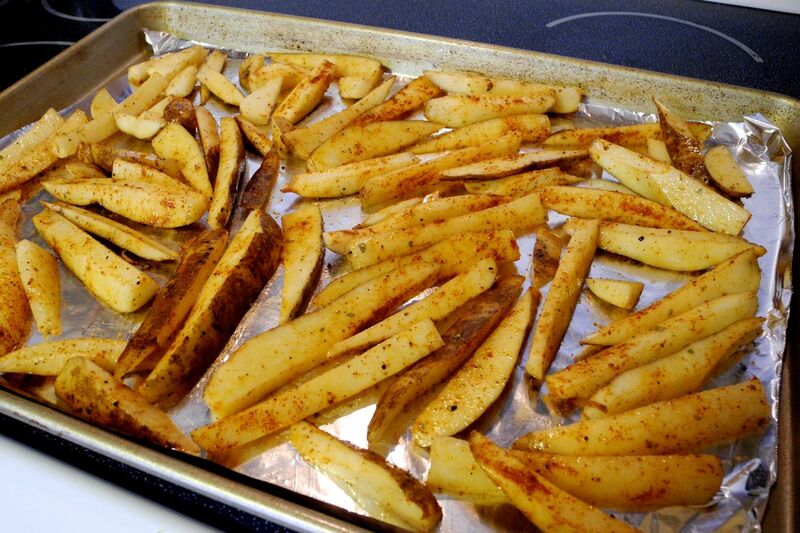 Spread the fries in a single layer on a foil-lined cookie sheet. Bake for 15 minutes, turning fries over about half way through. For crispier fries, cook on top rack or for a longer time.